Warning. This Project has High volt AC component. So construct only if you are experienced to handle high voltage circuits otherwise leave it.Take all precautionary measures to avoid Shock Hazards. Purchased one Adapter type SMPS power supply. It is rated 5V at 1 Amps. Its cost was Rs.100. Removed the cover and hacked the power supply board. 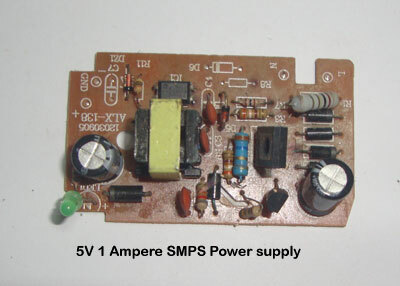 It is an SMPS power supply with AC-DC isolation. 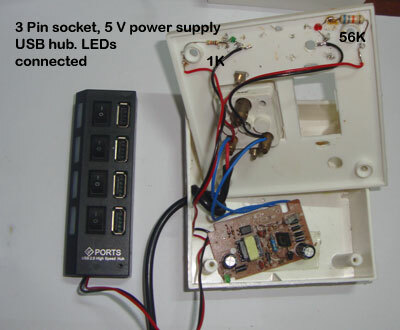 It can be connected to 220V AC and it gives 5V, 1 Amps current as output. So it is an ideal one to power the USB hub. 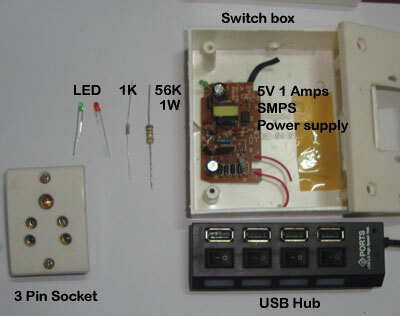 The USB Hub is the one with the provision to give external power. It has 4 USB sockets to use four devices simultaneously. It is actually for charging as well as for using the USB devices. For this, it has four wires. Red (Positive), Black (Negative), White (Data In ) and Green ( Data Out ). But since the Hub is using only for charging, these wires are not required. So removed the wires. The PCB of the Hub has a DC socket to give external power. Connected the DC output from the SMPS to the positive and negative points of the Hub DC Socket with correct polarity. 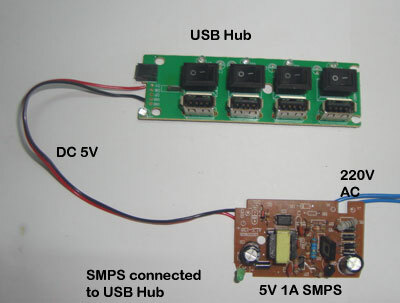 Well, the SMPS is powering the USB Hub. Everything connected. 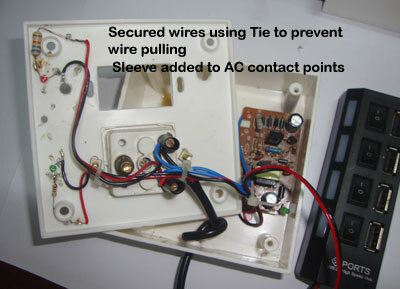 The wires are secured using Tie to prevent accidental wire pulling and detachment. 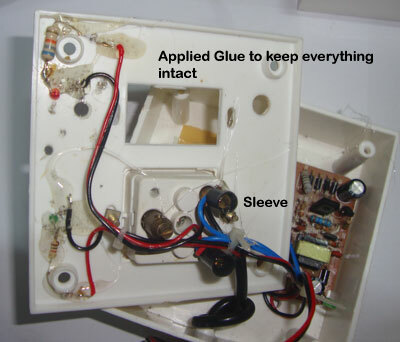 This is necessary , because if a detached wire from AC side makes contact with the DC side, it will cause shock hazard. Now there are two bare points carrying AC. These are the Pins of the three pin socket. These also made shock proof by enclosing inside plastic sleeve. Applied Glue to all loose points to make everything intact. So no wire, LED, resistors etc will detach from the box. Also glued the SMPS in the box. 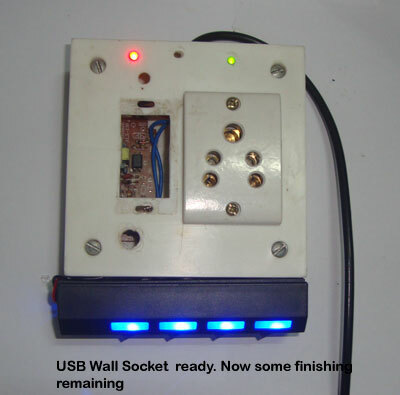 Now the USB Wall Socket is ready. 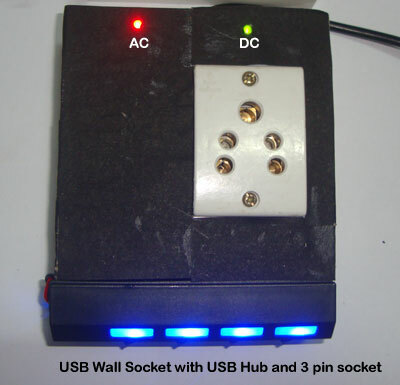 It is powering the USB Hub with sufficient current. 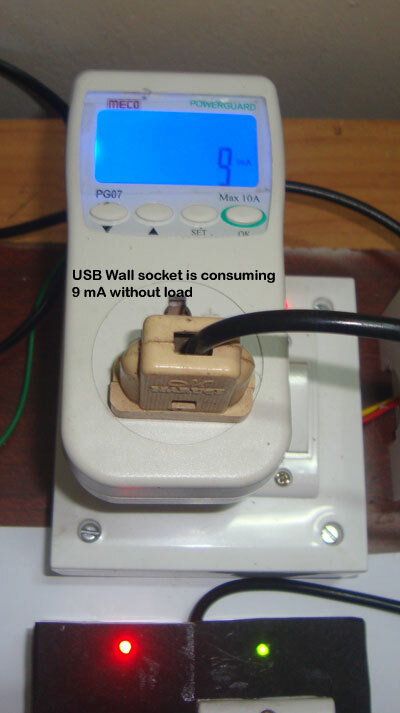 It also consumes 9 mA current without load. 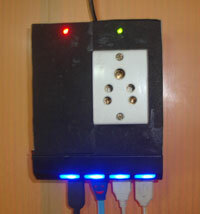 Connected 4 devices in the USB Hub. 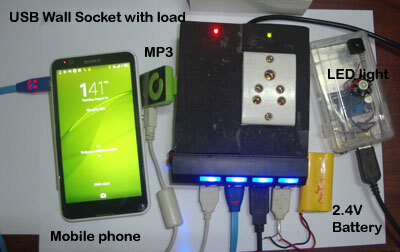 A Mobile Phone, MP3 Player, 1 Watt LED light and a 2.4V Battery for charging. All are charging properly. 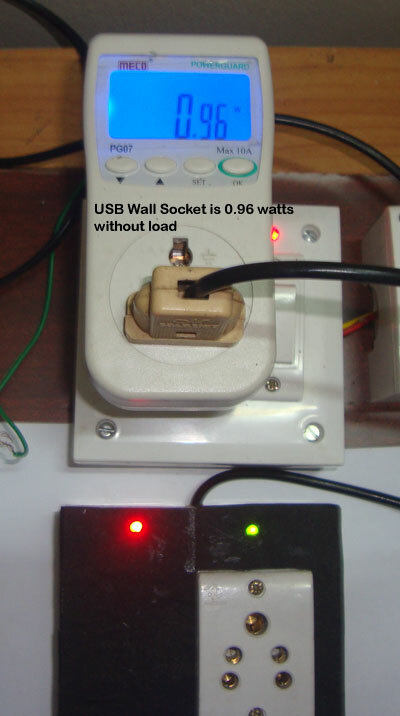 With load, the USB Wall socket is 9.19 Watts. It takes around 42 mA current. This is the AC side shown by the Power Meter. But the DC side is 1 Amps current. Now gave some touching to its outer side to give a good look. Now the USB Wall Socket is ready on the wall. 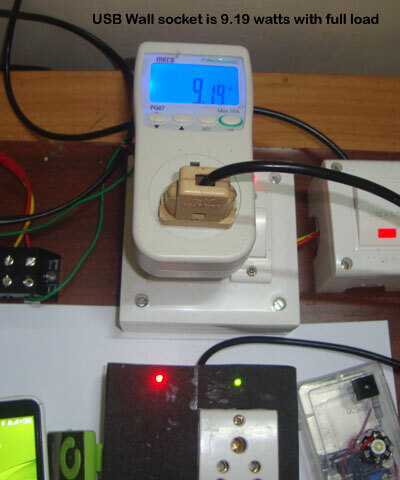 It can very well charge any USB device that requires 5V. This is necessary because if we forget to charge the devices, the Lithium Ion battery in these devices will damage permanently. So we have to allow the battery for its normal charge / discharge cycles.